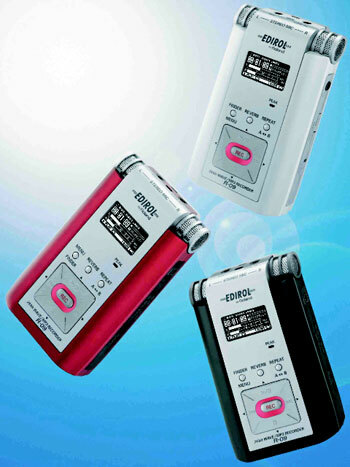 Edirol has introduced two new models, in red and white, of its R-09 portable recorder. The R-09W (in white) and R-09R (in red) will both retail at the same price as the original black version (about $400). New accessories include a carry case for the main unit and an earphone set with carry case. The R-09 won the Music Industry Association Award For Innovation last year, largely because of its design, which combines ease of use with advanced recording features. The R-09 features built-in stereo mics and uses SD data cards (a 64MB one is included) to store your sound. All recordings can be backed up to your computer via USB. The unit features an OLED (Organic Light Emitting Diode) screen.